When I first started teaching, I had a hard time even knowing what to teach, much less how. Once I went through the PATH certification process and learned about goals, objectives, lesson planning, and progression it became easier to decide what to teach in each lesson. Something that also helped was listing out every possible skill I could teach, in increasing order of difficulty. This way I could look on spectrum, see where my student was, and plan where to go from there. I made my list using the CHA Composite Horsemanship Manual, which explains riding and horse care skills in good detail through 4 levels. I just listed the skills in what I thought was the best order and put the book and page number after the skill for reference (b1p24 = book 1 page 24). And this is the list that I’m sharing with you today! Note: Order of skill progression will vary per student and per instructor’s preference. For example, some instructors prefer to teach the sitting trot before the posting trot, or to teach two point before they teach trotting. This totally depends on the student’s abilities and goals. So take this list as a rough outline that can be rearranged and edited as desired. Note: Not all the following are Skills. Skills are aids used to communicate with the horse (such as direct rein steering). Some of these are figures (such as the reverse) which are used to practice skills. The list is meant to give you ideas for what to teach. And those are just the riding skills! 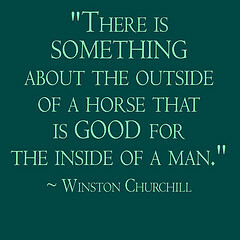 There is so much more you can teach about horse care and groundwork, too! I love this list!!! It is so great and very complete. I did some basic riding as a kid and now as a young adult I am looking at getting some riding lessons. Being an elementary school teacher it was important to me (and my learning) to have a set of competencies or goals of what I want to achieve. This list and your Groundwork and Horsemanship lists are exactly what I was looking for. It gave me a logical list of progressions to work through. Thanks for your hard work in developing these. It’s appreciated! Thank you for your comment, I’m so glad you found the list helpful! That’s neat to hear this list is helpful for not just instructors but students as well! My knowledge of horses extends to the fact that they have four legs; my knowledge of therapeutic riding is even less. However, after seeing this list I have a newfound profound respect for you, Cindy, and your fellow instructors. Thanks for sharing your knowledge and helping others who are in the same boat. Thank you for all knowledge, it’ll help me to be a good instructor. I am a trainer of both English and Western riding. I don’t have therapeutic students, but basics are the same. Love your blog as I am familiar with all you mentioned, but always looking for something new to mix things up. Thanks for a great blog. 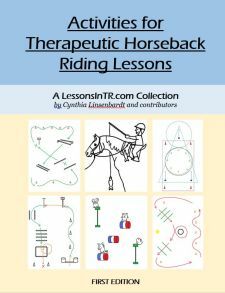 Hi Cherly, I’m so glad you love the blog and find it helpful for all types of riding lessons! I hope it continues to be a help! Happy Teaching! I am an older adult beginning rider. I have only been riding about 7 years and only the past three years with good instruction (although the lessons are few and far between because of distance). Things are finally starting to click and I want to put it all together in goals. I have been looking for a list to help me organize my goals for riding dressage. It’s hard to know what you need to know if you don’t know enough about what you need to know about!!! I feel slightly overwhelmed as I think about my fitness goals, my horse’s fitness goals, my skills (such as seat, legs, etc. ), my horse’s skills (rhythm, balance, etc. ), and finally, how we put it together as a team. This is a big help. THANK YOU! Hi Barb, I’ so glad the list helped you! That is great you are setting goals for yourself, as an instructor so often we are the ones setting goals for our students, and when the student does it themselves…excellent! I wish you all the best in achieving the goals you set! Also, you should check out my post “The Training Wheel” to see where the skills list fits in to all the other things you mentioned!